Depreciation is the decrease in the value of any type of Tangible Assets, such as plants, equipment and vehicles, over a period of time resulting from use, wear and tear, obsolescence or impairment. The opposite from appreciation. The use of depreciation affects a company's Book Value, and, in most countries, its taxes. 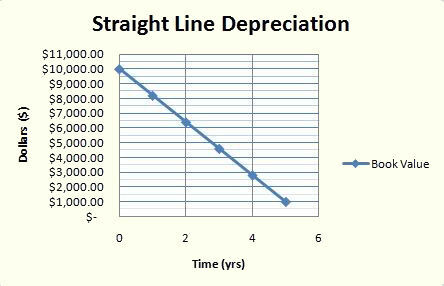 Straight-line Depreciation. 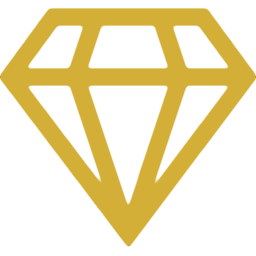 The simplest and most often used technique, in which the company estimates the "salvage value" of the asset after the length of time over which it is depreciated, and assumes the drop in the asset's value is spread evenly in equal, yearly increments over that amount of time. The salvage value is an estimate of the value of the asset at the time it will be sold or disposed of. 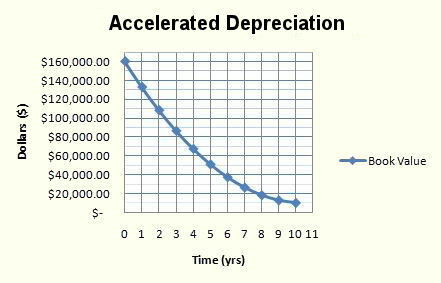 Accelerated Depreciation. A method of cost write-off in which the depreciation allowances are greater in the first few years of ownership than in subsequent years. Sum of Years Digits Depreciation Method. An accelerated schedule that adds up the digits for the remaining years of the useful life. An asset with three years of remaining useful life would add up 3 + 2 + 1 = 6. The depreciation schedule is then 3/6th for the first year, 2/6th for the second and 1/6th for the 3rd year, assuming no remaining value. Declining-Balance Depreciation Method. Each period's depreciation is based on the previous year's net book value, the estimated useful life, and a factor. The factor is commonly two; this is then known as double declining-balance. Double Declining Balance Depreciation Method. Same as Declining-Balance Depreciation Method where the factor used equals 2. The similar concept for intangible assets is called amortization. For natural resources like minerals and oil the similar concept is called depletion. This ends our Depreciation summary and forum.